Beautiful, newly constructed barn-cottage on 230 acres only 6.9 miles from the Oxford Square. 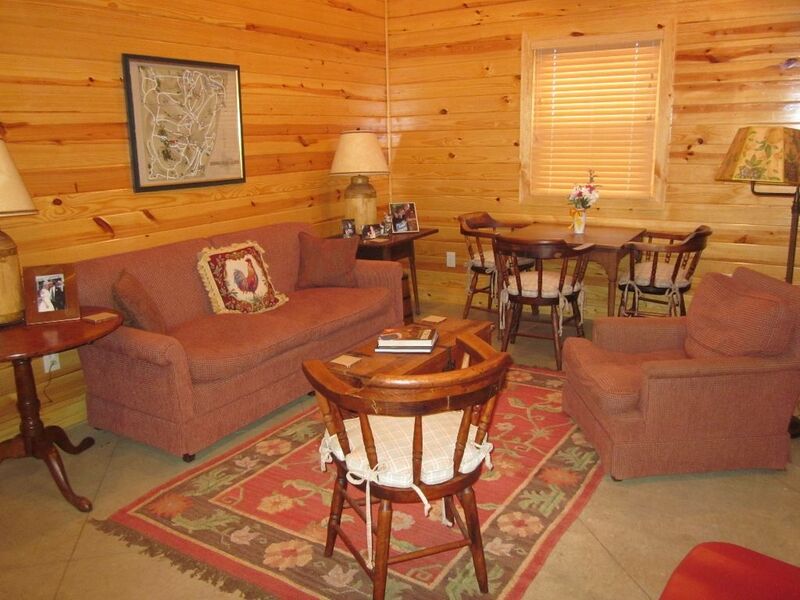 The property has knotty pine walls with a large living and kitchen area, screened porch and a large bedroom and bath. The Inn sleeps 4 (1 queen bed, 2 twin beds in the bedroom) and we can provide a roll-away bed to accommodate 1 more person in the living area if needed. (Rates are based on 4 guests. Each additional guest must pay $45 per night.) The bathroom has a shower, large closet, full-sized stack washer/dryer, and iron and ironing board. The living room and kitchen combination is complete with refrigerator, microwave, stove/oven, and large widescreen television with satellite and a DVD player. There are over a mile of walking trails through hardwood forests and around a beautiful lake. Fishing is allowed upon signing of waiver. The owners live on the property if there are any questions during your stay. toilet, shower, Bathroom has hair dryer, closet w/shelves, and washer/dryer. Dining area is in living room/kitchen area. Patio is a screened porch with table and chairs. The Inn is located on 230 acres of rolling hills with two lakes and incredible views. Guests can take advantage of the great hiking trails, biking paths, and fishing on the property. Guests should bring their own fishing and biking gear. Waiver required for fishing on lake. Great property with great owners. Everything was as expected or more. Highly recommended. This place is terrific for a small group or family. It sleeps 4 fine and if you don't mind a roll away in the living room, you can add another person. It's about 5-10 minutes from town and on a BEAUTIFUL piece of property. The small kitchen area is perfect, and has a TV in the living room area. We even cooked breakfast one day.....there's a grocery store very close by. I've stayed at this barndominium 4 times now, each time with a different group of people, and each time it was perfect. One time I had kids with me and they loved exploring in the woods, playing ping pong, visiting the pond and just playing outside. Claire, the owner, is so sweet and accommodating. She's very responsive and wants to make your stay perfect. All towels, hair dryer, sheets, pillows, shampoo, soap, coffee, are all included. The only thing confusing will be finding the barndominium on your first visit. You drive in their driveway and drive past the house (on your right), driving down the little hill and through the woods. I thought i was going wrong, but when I called Claire she assured me I was right and sure enough, I found it through the woods. You'll come upon an open space and there it is. Being away from the main house made it feel secluded. You can't see the main house from the barn so it doesn't feel awkward for you (or them). Would highly recommend this place for your stay of a small group. I loved the stay here! Quiet, surrounded by nature. Just what we needed, but also close enough to town to enjoy all that Oxford has to offer! Peaceful setting yet close to town. This converted barn felt miles away from it all, yet was only a few minutes to Oxford's town center. The barn was clean and comfortable and Claire was a delight to work with. I enjoyed their hiking trail and spent an afternoon reading by the pond. I highly recommend this rental for anyone looking for a quiet and relaxing get-away.. Awesome accommodations! Owners are very attentive! Highly recommend! We had a great experience staying here during my son's graduation from Ole Miss. The owners could not have been nicer or more accommodating. They stocked the cottage barn for us and their hospitality was unmatched. The cottage barn was very comfortable, clean, and had everything one needs to stay there. The owner supplied everything...all linens, towels, paper towels, TP, dishes, soaps, cleaning products, garbage bags, hair dryer, iron...right down to make-up removal facial wipes. The unit had a stackable washer and dryer; it also had a TV with DVD player. It was one of our best experiences renting through VRBO. What made the experience so pleasant was how responsible the owners were. The pictures show the cottage barn exactly as it is. It is perfect, quaint, and quiet! Thank you so much to the Crews family for allowing us to rent from them and being so hospitable. We will definitely stay there again!!! We had a nice stay. Beautiful setting with peace and quiet! We even had an opportunity to enjoy a nice stroll though the woods down to the lake. Checkout morning it was raining, which gave us a chance to enjoy the screened in porch. The Inn at Woodfield Farm is located 6.9 miles from the Square in Oxford, Mississippi. Oxford is a literary mecca in the rolling hills of North Mississippi. It is known for the University of Mississippi (Ole Miss), the homes of William Faulkner (Rowan Oak) and LQC Lamar, the University Museum, and wonderful independent bookstores, Square Books, Off Square Books and Square Books, Jr. There are art galleries, museums, and entertainment at the Ford Center for the Performing Arts and the Lyric Theater. Oxford has some of the best restaurants and shops in the South! *Deposit-Half of the rental fee required upon booking. *Deposit is refundable upon cancellation ONLY if owner is able to rebook for same dates. *Payment in full is required 10 days before arrival. *There is a 2 night minimum rental for this property. *On event weekends, there is a flat fee for a 2-day minimum stay. *NO SMOKING ALLOWED ON PROPERTY.